Our girls have made it through 4 YEARS as of tomorrow, isn't it just amazing. I haven't been a fan since their debut but that doesn't matter at all. I still appreciate all the work these girls have done. Their debut was four years from tomorrow! it's just amazing. Post your 4th anniversary videos, pictures, etc. YAY!!!! snsd jjang!! happy anniversary unnies!!! and happy anniversary to us SONES!!! im so proud of our girls!! Although it seemed impossible to break that trend SNSD managed to grab the hearts of many people within a short amount of time and let people know that RIGHT NOW it's Girls' Generation! Throughout these 4 years no one in SNSD left or joined. They were 9 girls who hurt together, ate together, and cried together. But mostly importantly, together, they shared one heart! SNSD also never gave-up, never backed down, and was fearless continuously fighting their obstacle courses. Thus, the reason why So Nyeo Shi Dae is one of the most loved people in the world today! 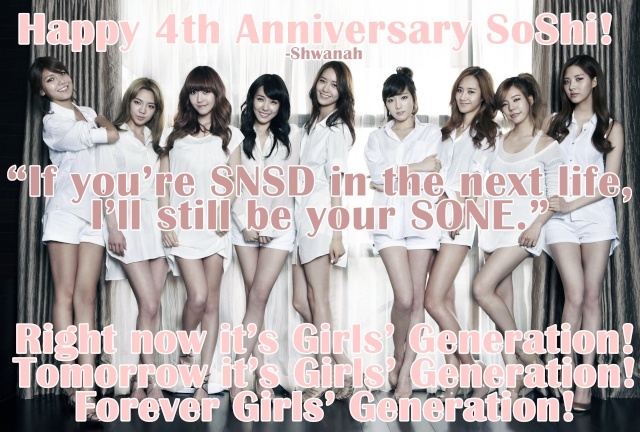 SNSD Jjang!Happy Anniversary to our girls. Jigeumeun Son Nyeo Shi Dae! Apeurodo So Nyeo Shi Dae! Yeongwonhi So Nyeo Shi Dae! I just realized that I'm a fan for over 2 years !